Mythic Delirium Books, 9780988912441, 226pp. "C. S. E. Cooney is one of the most moving, daring, and plainly beautiful voices to come out of recent fantasy. She's a powerhouse with a wink in her eye and a song in each pocket." "These stories are a pure joy. C. S. E. Cooney's imagination is wild and varied, her stories bawdy, horrific, comic, and moving-frequently all at the same time. Her characters are wickedly appealing, and her language--O her language. Lush, playful, poetic, but never obscure or stilted, it makes her magic more magic, her comedy more comic, and her tragic moments almost unbearable." "Bone Swans is a joy of feathery bones & ghoulish clowns. I adored every word. Like an eyas cries for meat, I cry for more. C.S.E. Cooney's a major talent and these are major talent stories. Who can resist hero rats, pouting swans, feral children, flying carpets and the Flabberghast? So tongue-tied am I with delight I fall back on the usual cliches: gripping, delightful, insightful, rollicking & lyrical--and yet not one cliche is to be found in Bone Swans, only stories of surpassing delicacy and wit, told by a lady of rare talent. Please, ma'am, might I have some more?" A swan princess hunted for her bones, a broken musician and his silver pipe, and a rat named Maurice bring justice to a town under fell enchantment. A gang of courageous kids confronts both a plague-destroyed world and an afterlife infested with clowns but robbed of laughter. In an island city, the murder of a child unites two lovers, but vengeance will part them. Only human sacrifice will save a city trapped in ice and darkness. Gold spun out of straw has a price, but not the one you expect. World Fantasy Award winner Ellen Kushner has called Cooney's writing "stunningly delicious Cruel, beautiful and irresistible." 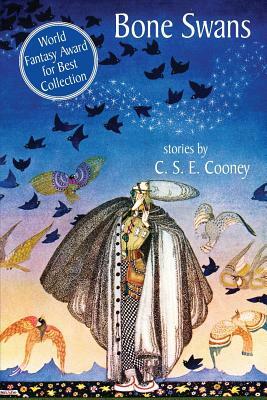 Bone Swans, the infernally whimsical debut collection from C. S. E. Cooney, gathers five novellas that in the words of Andre Norton Award winner Delia Sherman are "bawdy, horrific, comic, and moving-frequently all at the same time." Cooney's mentor, Science Fiction and Fantasy Writers of America Grand Master Gene Wolfe, proclaims in his introduction that her style is so original it can only be described as "pure Cooney," and he offers readers a challenge: "Try to define that when you've finished the stories in this book."